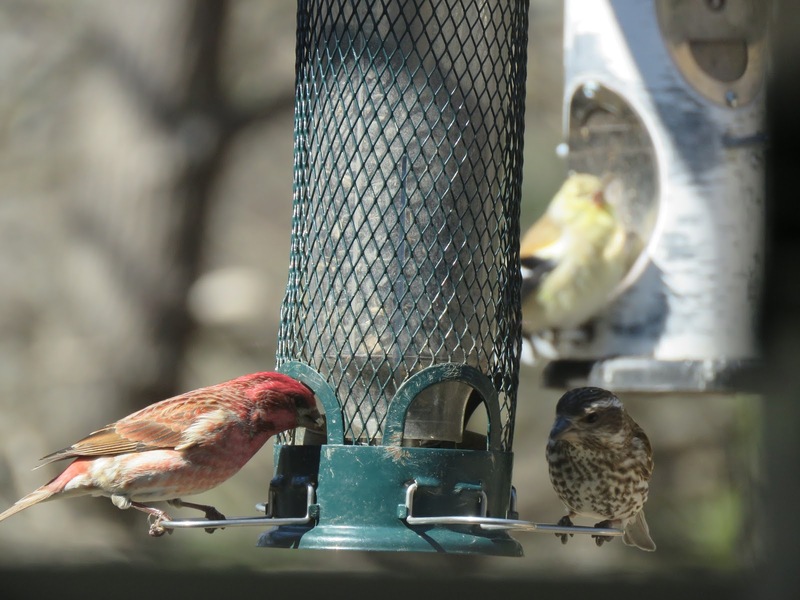 I am not sure how long my winter birds will stick around, but it is a treat to see the Pine Siskins, Red-Breasted Nuthatches and Purple Finches at my feeders. The Spring/Summer birds could be arriving any day now. The Pine Siskins are cute birds, they have a little stripe of yellow on their wings. The Red-breasted Nuthatch has always been a favorite. They are not shy, I can almost walk up to them before they fly away. I have seen the Pine Warbler often during the winter months at my suet feeder. 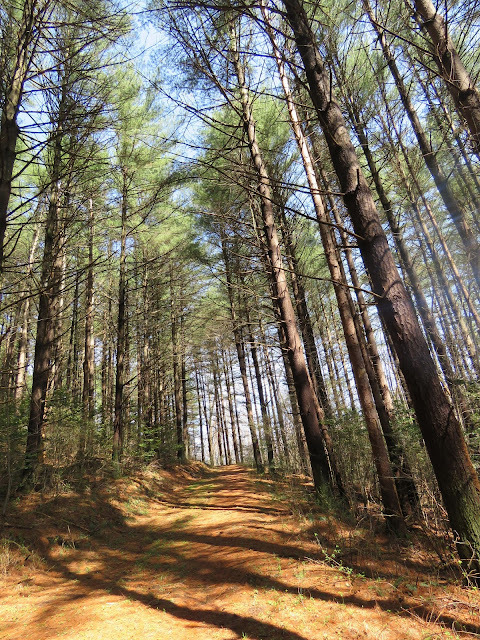 The Pine Warblers also are breeders in the forest across from our home. 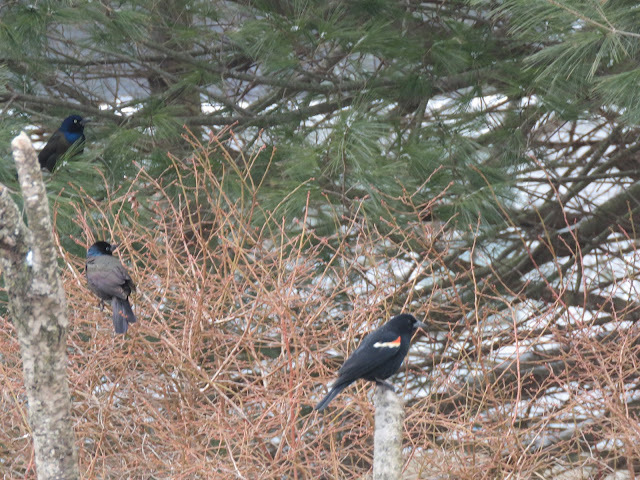 Recently it seemed like a flock of various Blackbirds were hanging around our yard, I saw the Common Grackles, Red-winged Blackbirds and Brown-headed Cowbirds. I have been seeing the Purple Finches off and on for a few weeks, the Goldfinch is behind the male and female Purple Finches. A delight to have so many variety of birds visiting and feeding at your place. I may not know the names of the birds but I enjoy watching them when they visit my garden in the morning. But they always fly away before I can take any snapshots of them. Hello, Marit! I do love the cute Nuthatches! Thanks for the comment and visit. Enjoy your day and weekend! Beautiful birds, as usual! Those blackbirds are gorgeous, I've never seen such before. Have a great weekend! These are beautiful pictures of these birds at the feeding place. Many birds come to your garden. Do you want to place my link, I can't. You have a great selection of backyard birds, Eileen. The Pine Warbler amazes me, certainly not a species I associate with feeders. I keep hoping for Pine Siskins; they are around they just haven't found my garden yet. And I have a smorgasbord laid in for them! Thanks David, for the comment. I do enjoy seeing the Pine Siskins and the Pine Warblers at my feeders. Recently I saw the male and possibly the female Pine Warblers at the feeder. Enjoy your weekend! Nice yard birds! I can't wait for spring migration to get underway as it has been a very quiet winter for me in my south Florida neighborhood. Thanks, Ken! I am looking forward to the Spring migration and the shorebirds to arrive. Enjoy your day and weekend! Hello, Yam, thanks and I do enjoy all the birds in my yard and at my feeders. 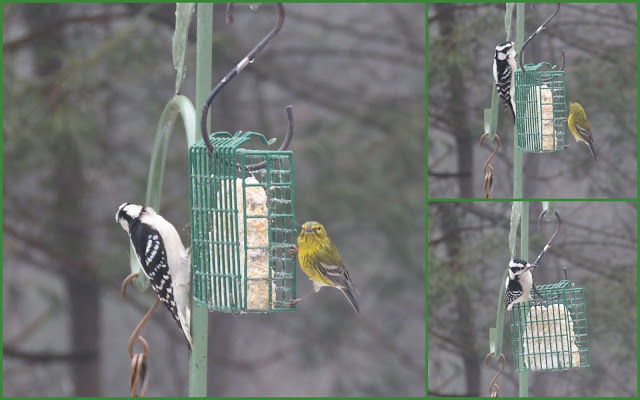 I think your Siskin is beautiful, a little more colorful than our Pine Siskins. Have a happy day and weekend! I love the first photo with the Pine Siskins at the feeder. It is picture perfect and would make a great card. Thanks for hosting and have a fantastic weekend! ...Eileen, you surely attract a wonderful selection of feathered friend at dinner time. Pretty birds, all wonderful photos! You are so lucky to have such wonderful birds visiting your garden. I am ready for the spring birds!!!! A frickan blizzard last night! Thanks for hosting. You're doing a good job. Thank you for hosting, Eileen, have a great new week! you are seeing and feeding such a great number and variety of birds. my attendance is still way down for me!! your pictures are so beautiful eileen, i like your feeder that looks like a birch tree. that's great for when you are taking pictures!!! i enjoy seeing the red-winged blackbirds, they are here down by the river but they never come up close to the house!!! We've had Red-breasted Nuthatches over the winter, though not as often as the White-breasted Nuthatches. Lots of finches and now a lot of grackles. We have seen more Red-breasted Nuthatches here this Winter than in years past. Fun birds to watch! It's always fun to see a little Downy fly in to the feeders too. Our Goldfinches are starting to get their bright yellow color. It's a fun time to feed our yard birds. Enjoy your weekend! I saw the first nuthatch for the year this week. Tiny but so pretty. You see such a great variety of birds, Eileen. Love it. When pine siskins come it's an eruption and we see many at one time. I would love to see the pine warbler! It is so colorful! Beautiful birds. Have a great weekend! Hello Eileen. Your year would seem to be at the same stage as our own. Winter birds sticking around but hints of spring and new arrivals. Our own Blackbirds, a close relative of your Robin, are getting very noticeable now as they start to sing and nest build. You have more lovely pictures today - always a treat to visit your blog and to join in the fun. The red wing blackbirds should be back here in April. Eileen, put out the seeds and the birds will come. Thanks for sharing. These guys will be heading up to us soon. I did hear a Red-winged Blackbird this week so that really means spring is here! Beautiful birds in your photos. You get such a great variety of birds in your yard. Wonderful pictures. Beautiful images after something to eat, lovely Eileen. Wow, i love these. Very nice ! Your yard is a happening place! Really fun birds to watch. I saw a red-winged blackbird today but he flew off before I raised my lens. I thank you for taking time out in your day to link in and share your blog with us birders at I'd Rather B Birdin'. To me the nuthatch stands out! Beautiful collection of images .. I love all the birds .. Regards .. Your feeders sure are busy. Mine were woefully vacant last summer as compared to when I lived in Illinois, but this spring I already have more than I've ever seen. Hoping it will be a fine bird year. Have a wonderful week! All the birds are fun to see - I'm noticing more singing in the mornings now, are you noticing the same thing? You have the best yard birds ! This must be an exciting time of year, with the birds in transition between seasons. Thanks for the lovely photos. Nice to see those birds up close. The red-winged blackbirds are a sign of spring here...haven't seen one yet but I did watch a small flock of cardinals sweetly singing yesterday. So the season is moving along. We also have all the other birds which is interesting. I love that you've caught the pine siskin...a flitty bird and often overlooked because of its colouring. However I've always loved that little flash of yellow. Such beautiful birds and the Pine Siskins really are cute. I do love those nuthatches! They are SO pretty! I missed this posting but this coming weekend I'm off and I'll be back here! Enjoy your week.